Fox News bring us news that a group has gone around checking on the temperature sensors used to compile “global warming” data. The group found that 90% of the monitoring stations violate the Government’s 100-foot rule of being within’ anything that could influence the results. A critical cog in the machinery that drives the theory of global warming is a small white box not too far from where you live. 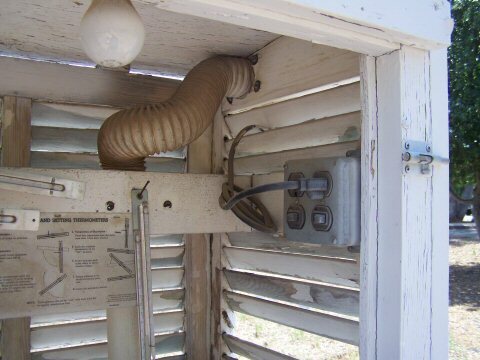 Inside the box sits a thermometer that tracks the local temperature, which in turn becomes part of a data trail for the monitoring of climate change on Earth. But there’s a problem: Nearly every single weather station the U.S. government uses to measure the country’s surface temperature may be compromised. Sensors that are supposed to be in empty clearings are instead exposed to crackling electronics and other unlikely sources of heat, from exhaust pipes and trash-burning barrels to chimneys and human graves. The National Climate Data Center (NCDC) uses this massive network of sensors to determine daily highs and lows at the 1,219 weather stations in its Historical Climatology Network (HCN). The network has existed since 1892, but only in the last decade has it come under intense scrutiny to determine whether the figures it measures can be trusted. • A sensor in Redding, Calif., is housed in a box that also contains a halogen light bulb, which could emit warmth directly onto the gauge. • A sensor in Hanksville, Utah, sits directly atop a gravestone, which is not only macabre but also soaks up the sun’s heat and radiates it back to the thermometer at night. • A sensor in Marysville, Calif., sits in a parking lot at a fire station right next to an air conditioner exhaust, a cell phone tower and a barbecue grill. • A sensor in Tahoe City, Calif., sits near a paved tennis court and is right next to a “burn barrel” that incinerates garbage. 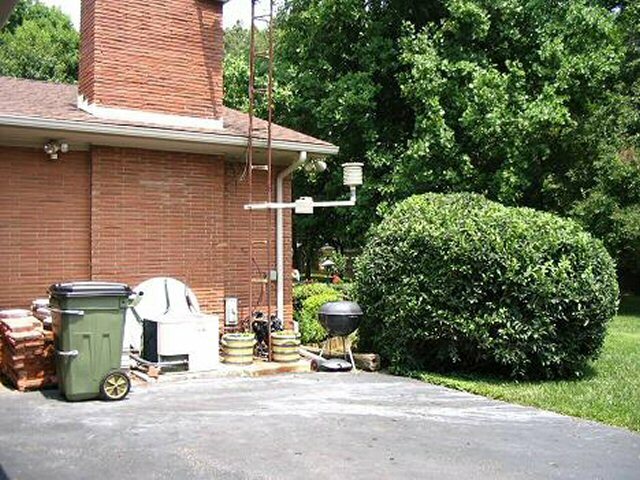 • A sensor in Hopkinsville, Ky., is sheltered from the wind by an adjoining house and sits above an asphalt driveway. • Dozens of sensors are located at airports and sewage treatment plants, which produce “heat islands” from their sprawling seas of asphalt and heavy emissions. 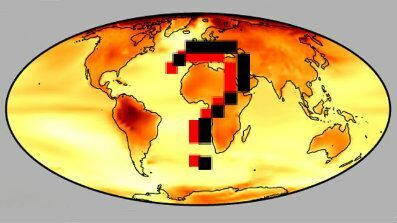 Watts, who has posted pictures of the sensors on his Web site, SurfaceStations.org, says he believes that the location of the sensors renders their recorded temperatures inaccurate, which in turn brings some of the data behind global warming theory into question. “It’s asinine to think that this wouldn’t have some kind of an effect,” Watts told FoxNews.com. But climate scientists who analyze the data say that they are able to account and adjust for the faulty locations by comparing warming trends they spot at bad sites to trends they see at good ones. “If you use only the sites that currently have good siting versus those that have not-so-good siting, when you look at the adjusted data basically you get the same trend,” said Jay Lawrimore, chief of the climate monitoring branch at NCDC. Lawrimore admitted that Watts’ volunteers had discovered real problems with sensor siting, but he said that even when those sites’ heat readings were adjusted down, they still showed a steady overall rise in temperatures. “The ultimate conclusion, the bottom line is that there really isn’t evidence that the trends have a bias based on the current siting,” he said. And surface station data is only a small subset of information confirming the warming of the climate, Lawrimore said. Changes in air temperature, water temperature, glacier melt, plant flowering, tree growth and species migration, among many others, show the same worldwide trend — a 0.7 degree Celsius jump (1.2 degrees Fahrenheit) in the past century. “There’s a certain amount of uncertainty in the calculation of trends, but not to the extent that we don’t know the climate is warming,” he said. Watts readily agrees that temperatures are on the rise worldwide, but he believes the magnitude of the increase is in question, and he says his research puts the 1.2-degree global figure in doubt. But a team of three climatologists has completed a study of Watts’ data on HCN siting and found the warming trend to be confirmed. “It’s all objective analysis based on statistics,” said Matthew Menne, the lead author of the study. But Menne’s study was conducted using information on only 43 percent of the weather stations. Watts, who has now compiled information on 80 percent of the stations and cleaned up his old information, contends that a more complete data set would furnish different results, and he plans to conduct a study of his own under the aegis of Roger Pielke Sr., a research scientist at the University of Colorado in Boulder. A better test of the network’s data is on the horizon. In the past eight years, the NOAA has established a hi-tech system that sends information via satellite and abides by all of its own rules for siting. Each sensor is ideally placed in open areas far from other structures, a fact that pleases both government scientists and longstanding critics like Watts. “I’m convinced that the new system, the Climate Reference Network, will provide a reasonably accurate set of readings,” Watts said. But data has only begun to be collected from CRN, a regional network of just 114 climate sensors that went fully online in 2008. It will take at least a decade, and as many as 30 years, until the information it collects becomes statistically significant. In the meantime, and for many years past, the challenged data from NCDC has been providing information for a number of top climate research centers, including the U.N.’s International Panel on Climate Change, NASA’s Goddard Institute for Space Studies, and the Hadley Climate Research Unit, headed until recently by Phil Jones, who resigned in the wake of the climate-gate scandal. With mounting pressure on climate research facilities, scientists at the NCDC hope that their data won’t be discounted because of the troubling images Watts has compiled. WorldNetDaily has an interesting report on how certain leaders of the “green” movement publicly oppose “clean coal” while supporting companies that produce it. The story doesn’t stop there. The companies that produce “clean coal” also support groups that adamantly oppose, and even deny the existence of, “clean coal”. Read on for yet another example of environmentalist ideas in the wild. Big Bend Coal Power Station in Apollo Beach, Fla.
Board members and endorsers of the Apollo Alliance, which successfully promoted “clean coal” funding as part of President Obama’s $787 billion “stimulus” bill, also have endorsed a group led by Al Gore that opposes the White House’s “clean coal” efforts, going so far as to claim “clean coal” doesn’t exist, WND has learned. The Apollo Alliance board of directors includes a slew of extremists. The group has boasted in its own literature of its role in helping to craft portions of the multi-billion-dollar American Recovery and Reinvestment Act that Obama signed into law last year. Senate Majority Leader Harry Reid lauded the Alliance for helping craft the “stimulus” bill. “The Apollo Alliance has been an important factor in helping us develop and execute a strategy that makes great progress on these goals and in motivating the public to support them,” Reid said in a statement. A slew of groups that support the Apollo Alliance as well as individuals on Apollo’s board endorsed what was known as the “New Apollo Program and the Apollo Economic Recovery Act,” a mock recovery act on which sections of Obama’s “stimulus” bill was partly based. That act also called for funding for “clean coal.”However, WND has leaned many of those same Apollo endorsers and board members also are members of Gore’s lobby group that opposes “clean coal” initiatives. In 2008, Gore launched the Reality Coalition, a national grassroots and advertising effort with a simple message: In reality, there is no such thing as clean coal. Coal, Reality Coalition argues, cannot be considered clean until its carbon dioxide emissions are captured and stored. Gore’s group has backed a multi-million dollar ad campaign, running in print, broadcast and online media, opposing Obama’s “clean coal” initiatives. At the launch of Reality Coalition, Gore wrote a New York Times op-ed arguing that until coal is truly clean, there should be no new coal-fired power plants built in America. However, the National Wildlife Federation is an Apollo Alliance endorser. However, the League is an Apollo Alliance endorser. Other Apollo endorsers who also support Gore’s anti-“clean coal” include the Natural Resources Defense Council and Sierra Club. Sierra’s executive director, Carl Pope, is an Apollo board member as well. Discover the Networks notes that in July, Reid and House Speaker Nancy Pelosi appointed Apollo Alliance Chairman Angelides to serve as chairman of the newly created Financial Crisis Inquiry Commission. Joel Rogers, a founder of the socialist New Party. WND reported on evidence indicating Obama was a New Party member. In an interview with WND, New Party co-founder and Marxist activist Carl Davidson recounted Obama’s participation with the New Party. Jeff Jones, a founder of the Weather Underground domestic terrorist group who spent time on the run from law enforcement agencies while his group carried out a series of bombings of U.S. government buildings.Jones joined the Students for a Democratic Society, or SDS, from which the Weathermen splintered in the fall of 1965. Two years later, he became the SDS New York City regional director, a position in which he participated in nearly all of the group’s major protests until 1969, including the 1968 Columbia University protests and the violent riots that same year at the Democratic National Convention.In 1969, Jones founded the Weathermen with terrorists William Ayers and Mark Rudd when the three signed an infamous statement calling for a revolution against the American government inside and outside the country to fight and defeat what the group called U.S. imperialism. President Obama came under fire for his longtime, extensive association with Ayers. Jones was a main leader and orchestrator of what became known as the Days of Rage, a series of violent riots in Chicago organized by the Weathermen. The culmination of the riots came when he gave a signal for rowdy protestors to target a hotel that was the home of a local judge presiding over a trial of anti-war activists. Jones went underground after he failed to appear for a March 1970 court date to face charges of “crossing state lines to foment a riot and conspiring to do so.” He moved to San Francisco with Ayers’ wife, Bernardine Dohrn. That year, at least one bombing claimed by the Weathermen went off in Jones’ locale at the Presidio Army base. Jones’ Weathermen took credit for multiple bombings of U.S. government buildings, including attacks against the U.S. Capitol March 1, 1971; the Pentagon May 19, 1972, and a 1975 bombing of the State Department building. Climate Depot has a response from the UK’s Lord Christopher Monckton to the Democrats who have refused to allow him to testify against former Vice-President Al Gore at a hearing examining the House’s “global warming” bill. Washington DC — UK’s Lord Christopher Monckton, a former science advisor to Prime Minister Margaret Thatcher, claimed House Democrats have refused to allow him to appear alongside former Vice President Al Gore at a high profile global warming hearing on Friday April 24, 2009 at 10am in Washington. Monckton told Climate Depot that the Democrats rescinded his scheduled joint appearance at the House Energy and Commerce hearing on Friday. Monckton said he was informed that he would not be allowed to testify alongside Gore when his plane landed from England Thursday afternoon. According to Monckton, Rep. Joe Barton (R-Texas), Ranking Member on the Energy & Commerce Committee, had invited him to go head to head with Gore and testify at the hearing on Capitol Hill Friday. But Monckton now says that when his airplane from London landed in the U.S. on Thursday, he was informed that the former Vice-President had “chickened out” and there would be no joint appearance. Gore is scheduled to testify on Friday to the Subcommittee on Energy and the Environment’s fourth day of hearings on the American Clean Energy and Security Act of 2009. The hearing will be held in 2123 Rayburn House Office Building. According to Monckton, House Democrats told the Republican committee staff earlier this week that they would be putting forward an unnamed ‘celebrity’ as their star witness Friday at a multi-panel climate hearing examining the House global warming bill. The ‘celebrity’ witness turned out to be Gore. Monckton said the GOP replied they would respond to the Democrats ‘celebrity’ with an unnamed ‘celebrity’ of their own. But Monckton claims that when the Democrats were told who the GOP witness would be, they refused to allow him to testify alongside Gore. CNSNews is reporting that the EPA has ruled that “greenhouse gases” are a health hazard and can be regulated by legislation. They also ruled that tailpipe emissions contribute to “climate change”. This is just the next step in bigger Government regulation, higher taxes, and increases in goods and services. So far, Obama and the Democrats’ wishes are coming true. Washington (AP) – The Environmental Protection Agency has concluded that carbon dioxide and five other greenhouse gases are a danger to public health and welfare. It is the first step to regulating pollution linked to climate change. Congressional sources told The Associated Press that EPA will announce its proposed finding Friday and begin a comment period before issuing a final ruling. The EPA also will say tailpipe emissions from motor vehicles contribute to climate change. The officials spoke on condition of anonymity because the finding hasn’t been announced. The action was prompted by a Supreme Court ruling two years that said greenhouse gases are pollutants under the Clean Air Act and must be regulated if found to be a human health danger. CNSNews has a commentary about the CO2/”global warming”/”climate change” farce that keeps gaining traction here in the U.S. even in the face of mounting scientific evidence against it. More and more scientists are discounting “global warming” . Check the related posts below for more info. My friend, the internationally famed climatologist Dr. S. Fred Singer, calls them “the CO2 wars.” It is the last ditch attempt by the Greens, under the aegis of the Obama administration, to declare carbon dioxide a pollutant and thus open the door to its regulation. I am increasingly of the opinion that the main goal of the Obama administration through CO2 regulation, exploding deficits, punishing taxation, and any other means at their disposal is the destruction of the economy and the complete control of impoverished Americans. This is an administration that exists to impose an Orwellian socialist utopia after the smokescreen clears. When it comes to CO2, Obama, his so-called science advisors, and the Environmental Protection Agency are all lying. It is governmental gangsterism. — CO2 is not a “pollutant.” It is a trace gas necessary for all life of Earth because it is essential to the growth of all vegetation. — Without CO2 all vegetation—grasses, forests, jungles, crops such as wheat, corn and rice—dies. Then herbivores die. Then you die. — The CO2 produced by human industry or activity is a miniscule fraction of a percentage of greenhouse gases. It constitutes a mere 0.038% of the atmosphere. — The oceans emit 96.5% of all greenhouse gases, holding and releasing CO2 as it has down through the millennia of Earth’s existence. — In past millennia, CO2 levels were often much higher than the present. — CO2 levels rise hundreds of years after temperature rise on planet Earth. — The Sun is the primary source of warmth on Earth. Rising CO2 is an effect of global warming, not a cause. — Both global warming and cooling are natural phenomenon over which humans have no control. — The Earth is not currently warming. It has been cooling for a decade and likely to continue for at least another twenty years or longer. If a new Ice Age is triggered, it will last at least 10,000 years. — Polar ice is now at record levels and still growing. If you had a choice, would you prefer a warmer or colder Earth? And consider this, if only the United States was to significantly cut its CO2 emissions, how much effect, if any, would that have in a world where most other nations, including China and India, have no intention of doing so? Both are exempt from the UN Kyoto Protocol. The answer is zero! The federal government, though the aegis of the EPA, would have control over the destinies of an estimated 13,000 facilities if this regulatory obscenity were to become law. Such industries would flee the United States as the most toxic place on Earth in which to do business. This would be the fulfillment of the Obama administration’s goal and explains in part why this new assault on science, industry, and common sense has been put forth by the EPA. FOX News has an article about tomorrow’s “Earth Hour”. The short version is that “Earth Hour”, for the typical household, creates more CO2 than using electricity. How? Candles. You have to see, somehow, during that time. The candles that a house would use to see during that hour emit more CO2 than incandescent or fluorescent lights would. Secondly, carbon dioxide is not a pollutant. You and I exhale CO2 every time we breathe, and plants need that CO2 so they can “breathe”. This is all about money and power. Obama’s cap-and-trade program is going to do nothing but increase your energy bill, gas prices, food, and every other good you buy now. The extra money you get in your paychecks starting next month will mean nothing to the hundreds you are going to pay in increase costs if Obama gets his way. “Earth Hour” is just another stunt for the people who push “global warming” to keep their propaganda and agenda to the masses when more and more people and scientists are coming to the correct conclusion that “global warming” is a bunch of crap. See the related posts below for more. In what it’s calling a “vote for the future of planet Earth,” the World Wildlife Fund wants every light in the world to go dark for one hour on Saturday as a symbolic gesture to call for action on climate change. It’s called Earth Hour — and among the places where the lights will go out are the Eiffel Tower, the Bird’s Nest Stadium in Beijing, the Pyramids of Giza and Niagara Falls. And, for the first time in the event’s three-year existence, the New York headquarters of the United Nations will also go dark, a move officials say will save a whopping $102, a figure that fluctuated wildly when requested from U.N. officials. Earth Hour — 8:30 to 9:30 p.m in every time zone on the planet — promises to be “the largest demonstration of public concern about climate change ever attempted,” U.N. Secretary-General Ban Ki-moon said earlier this month. But critics say the U.N.’s participation in the event is a “self-serving,” thinly guised “gimmick” to sway public opinion ahead of the U.N.-led conference in Copenhagen in December at which world leaders will seek to approve a new global warming treaty. “It’s like a lot of what the U.N. does — it’s a gimmick, it’s empty, it’s shallow and it’s not going to lead to anything,” said Thomas Kilgannon, president of Freedom Alliance, a Virginia-based nonprofit organization founded by Oliver North. WWF organizers say nearly 2,900 cities worldwide will participate in Earth Hour, with at least 250 American cities among them, including Chicago, Dallas, Miami and San Francisco. Plenty of celebrities have signed on to the cause, including musicians Alanis Morissette, Melissa Etheridge and Wynonna Judd, as well as actors Edward Norton, Cate Blanchett, Kevin Bacon and Kyra Sedgwick. And, of course, the United Nations. Critics like Rosett say the U.N.’s role in Earth Hour is merely the public face of its much larger push to reorder the world’s economy with new taxes, tariffs and subsidies for greenhouse gas abatement. Click here for the details on the U.N.’s new plan to combat climate change. Based on average energy consumption levels from 2006-08, U.N. spokeswoman Vannina Maestracci said the world body’s New York headquarters will save $102 while observing Earth Hour. Maestracci initially estimated the savings would be $81,000 before revising it to $24,300. She ultimately estimated the savings would be just $102 for the darkened hour. Though she stressed that the U.N. is just one of many institutions across the world observing the event, she acknowledged it’s a “strong symbol” in the climate change debate. Whatever the savings, Rosett accused U.N. officials of distorting facts to make its participation in the event appear more impactful. WWF spokeswoman Leslie Aun said Earth Hour will serve as a dramatic “visual message that the people of the world” are concerned about climate change. But Bjorn Lomborg, author of “The Skeptical Environmentalist” and director of the Denmark-based think tank Copenhagen Consensus Centre, said the event could actually increase emissions. Dr. Kenneth Green, a resident scholar on environmental science at the American Enterprise Institute, said Earth Hour shouldn’t even be considered an environmental activity, since there will be no tangible benefits. “If the U.N. is trying to show it’s really committed to the Earth,” he said, “they should scrap the giant fleet of black limousines they drive around in and buy hybrid cars in the United States to help the economy of the country they’re in. “That’s the real tragedy in what this symbolizes. They’ve taken the one thing that symbolizes man’s advancement over animals — that is, man’s ability to create light — and they’ve turned it into a bad thing.